Coming up on 30 years in business, K McKenna Haulage (Kieran McKenna) in Clones, Co. Monaghan is one of the leading bulk animal feed transport specialists in the country. The TASCC-registered contractor arranges collection and delivery from farms, mills, docks, ships and stores across Ireland and the UK. Peace of mind, trust and transparency are always assured with K McKenna Haulage which has been a member of the Trade Assurance Scheme for Combinable Crops (TASCC) for the past number of years. The TASCC code of practice aims to combine food / feed safety legal requirements with recognised industry good practice and specific customer requirements to provide confidence in the food / feed chain. K McKenna Haulage’s drivers are TASCC trained and up-to-speed with current legislation, while their trailers and high-pressure bulk blowers are also TASCC-compliant. 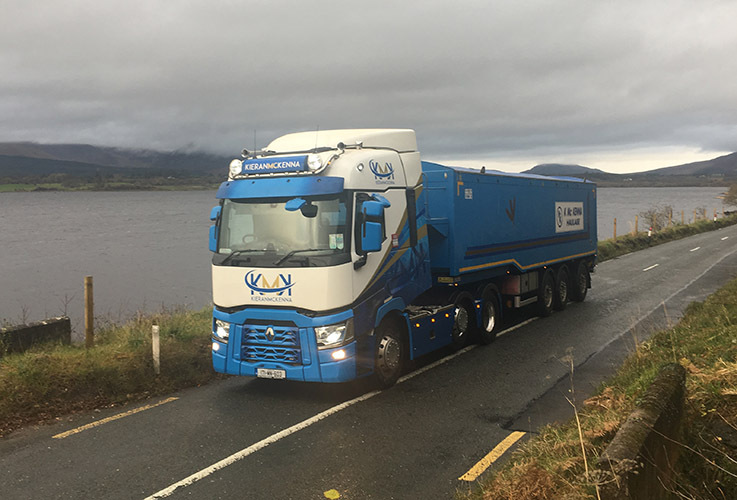 “We pride ourselves on being the best around when it comes to bulk animal feed haulage,” says Mark McKenna, whose father Kieran founded the business in 1989. “As well as specialising in animal feed collection, delivery and removal, we are also involved in biomass transportation. By adhering to the TASCC code of practice, our customers can rest assured that every job we undertake is to the highest standard and is fully transparent. 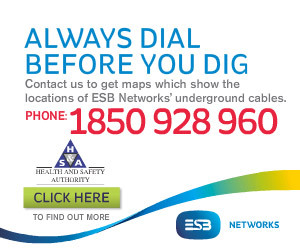 We comply with the strictest regulations and have built up a strong level of trust with our customers as a result. K McKenna Haulage is a real family affair with Kieran, his wife Mary and their sons Mark and Shane being all involved. Kieran has over 45 years’ experience in the bulk transport business, while Mark was shortlisted for the Transport Manager of the Year accolade at the 2017 Talent in Logistics Awards in the UK and was voted the number one apprentice mechanic in Northern Ireland for 2010 and 2011. Mark divides his time between the office and being behind the wheel, while Kieran, Shane and Joe Cassidy are full-time drivers. AW Ennis in Virginia, Co. Cavan, J Grennan & Son in Rath, Co. Offaly and Lakeland Dairies Agribusiness in Lough Egish, Co. Monaghan are among the animal feed milling companies K McKenna Haulage works for. AW Ennis has been manufacturing coarse Krunch feeds, pellets and mash for ruminants, pigs, poultry and game birds for nearly 200 years, while J Grennan & Son has been involved in agri trading since 1878 with its core business being the manufacture and distribution, at both wholesale and retail level, of animal feeds, fertilisers and agricultural seeds. Lakeland Dairies Agribusiness operates a state-of-the-art animal feed mill in Lough Egish which is approved by the Department of Agriculture, Food and the Marine and is also accredited to the UFAS quality standard. Lakeland is committed to supplying a product of the highest quality and one which guarantees full traceability. “We try to concentrate on bulk animal feed haulage as much as possible because it’s what we do best. We have an excellent working relationship with the mills, as we do with the dairy, pig and poultry farmers we deliver to. My father was working for AW Ennis before he set up this business. We also do some blower and tipper work in the UK and transport wood pellets for Premium Pellets in Drogheda,” Mark explains. K McKenna Haulage runs a fleet of six articulated trucks and nine bulk tipping trailers. The trucks are a mixture of Renault, Volvo and Scania. Last year, the McKenna’s purchased a brand-new Renault T480 from Toal Truck Services in Middletown, Co. Armagh, where Mark trained as a mechanic for three years. They also deal with McElvaney Motors and McDonnell Commercials (both Monaghan) for their Scania and Volvo needs. Toal Truck Services and Keelcom in Ballyconnell, Co. Cavan supply them with their parts and accessories, while tyres are purchased from West Lake Tyres Ltd. The trailers were supplied by Muldoon Transport Systems in Dungannon, Co. Tyrone and Bulk Services in Armagh. The fleet is maintained and serviced by local mechanic David Genco. K McKenna Haulage recently changed its fleet colours from dark / light blue to light blue / white with a gold band. A new logo was also designed to give the trucks a fresh look. “There has been a great reaction to the new livery. We take immense pride in the appearance of our trucks. They are our shop window at the end of the day. “We are committed to providing a fast, reliable, friendly and transparent service. We would like to take this opportunity to thank all our customers for their continued support and loyalty,” Mark concludes.